Bow ties have a tendency to play second fiddle to the tie when it comes to the modern gentleman's neckwear and both online shops and shops on the high street usually stock a very limited selection of bow ties. Bow ties are generally reserved for special occasions and is usually worn as an accompaniment to a tuxedo. Regular bow tie wearers are relatively few and far between but they all have one thing in common, their stylish appearance. You hardly ever see sloppy dresser wearing a bow tie. On the other hand, it is, unfortunately, not uncommon to see people looking like they fell out of the closet sporting a mismatching tie. The reason for this can probably be put down to the aforementioned availability and I also think there is a higher threshold for putting on a bow tie rather than a regular tie. There is, however, no reason why this should be so and a lot more people could, with great success, wear bow ties on a more regular basis. I am no regular bow tie wearer myself, but I am so pleased with my new bow tie from the Bow Tie Club that I think that may change somewhat. 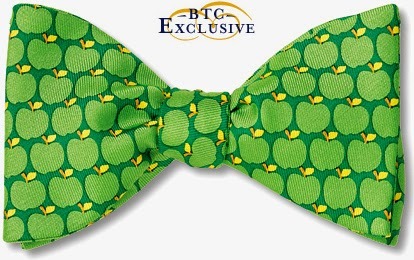 I don't think there's anything wrong alternating between ties and bow ties and that is likely to be my approach. Kirk Hinckley has been trying to improve the situation for the bow tie for the last twenty years. After having worked at Brooks Brothers, Nordstroms and Joseph Bank Clothiers, he realised that the bow tie market was being ignored and that the bow tie wearer deserved and desperately needed a better selection of quality bow ties. Thus, in 1994, Hinckley founded the Bow Tie Club as a mail order company with the intention of providing the biggest collection of high quality bow ties available. I'm sure the business has developed a fair bit over the last twenty years but as it appears today I think you'll be hard pressed to find a company with a better selection of bow ties. Kirk's wife Corinne designs all the bow ties, her 20 years experience in graphic design and her work as an artist help inspire the designs. Having had a good look at the different designs available at the Bow Tie Club it is clear Corinne is doing a brilliant and inspired job. 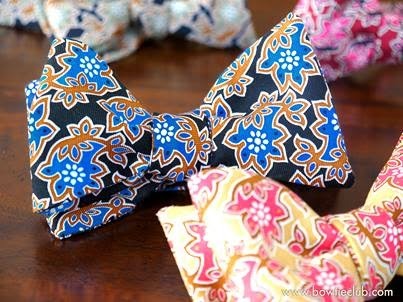 There are bow ties for any occasion or any mood. 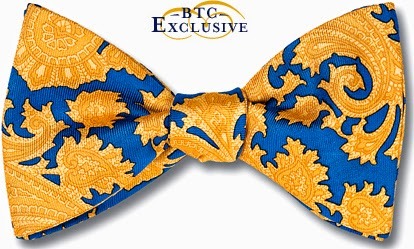 The silk the bow ties are made from is also custom made for the Bow Tie Club and has the highest weight for any printed silk bow ties available, with a weight of 22 momme (the unit of measure for the weight of silk). Weight is important for two reasons. Firstly, it allows more dye to be absorbed into the silk creating brighter and more vivid colours and, secondly, the heavier cloth wears better which is so important in a bow tie. 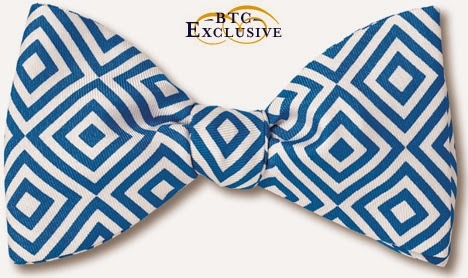 The Bow Tie Club offers over 400 unique bow ties and they are available in 48 variations including pre-tied, clip-on, tie your own, longer neck, shorter neck, larger and smaller neck, diamond point, straight edge etc. In other words, no matter what your preferences are, I'm sure you'll find something at the Bow Tie Club. 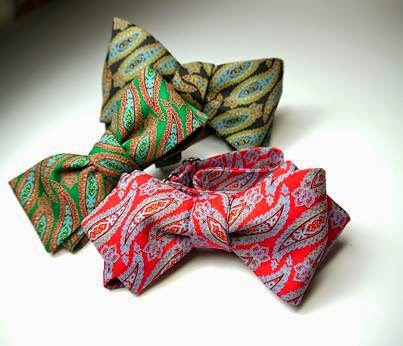 Below are a few examples of what's available from the Bow Tie Club. Visit their website for plenty more exquisite designs. The below photos are take from the Bow Tie Club website and face book page.